This has been confirmed! See you there. Remember to bring your SUP Leash! You must be attached to your board via a suitable leash for every Paddleloop. Drop into to your local SUP shop and pick one up before Sunday. Registration 0700 for a 0730 start. Come down to Deep Water Point Mt Pleasant, it's a free event for SUPWA members or $5 to non members, just nominate your completion time. It isn't a race, but about having fun. Nominate a time that you think you will achieve - next PaddleLoop try and beat that time. The trick is to paddle consistently at a speed you feel comfortable with - which is entirely up to you! The winner is the person closest to their nominated time. The winners receives a great SUPWA T'shirt for those closest to their time - also the top 5 paddlers (closest to their time) receive Pod Points for their Pod. 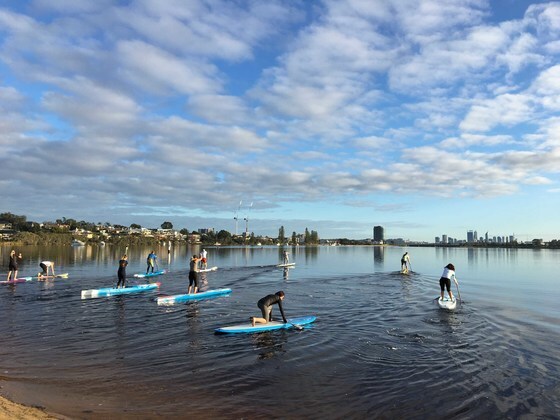 It's a fun opportunity to get involved with the very friendly SUPWA community and try or develop your SUP paddling. Get some tips, have some fun or have a goal for fitness. Open to all levels and all ages. (kids under 10 should be accompanied by an adult around the course).